I suppose at this stage Christmas and New Years is a distant memory for most, but I hope everyone had as nice a festive season as I had. Back to reality with a bang there on Monday and back to business as usual with the blog. I am loath to use the ‘D’ word – last nights dinner was a big cheesey quesadilla and potato waffles – but I did think this was a good time to post this recipe. There have been a lot of searches for my DIY Pot Noodle recipe so I think a lot of people are making their own lunches to bring to work to get through January, whether that’s for financial or health reasons is anyone’s guess! I regularly make this soup for work lunches or if I don’t really want a proper dinner, this is a perfect substitution. 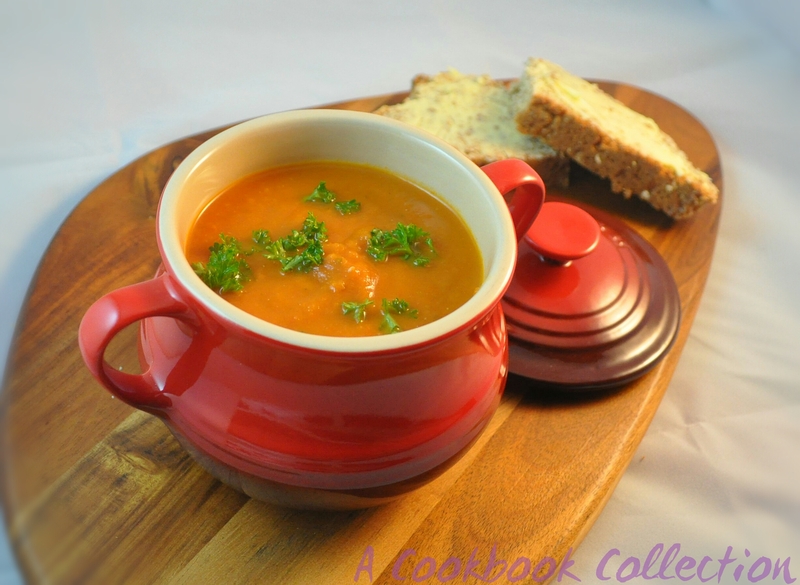 It is very light and is a really adaptable recipe. You can leave out the carrot, celery and oregano, up the tomatoes by 100g and add a bunch of basil leaves to make a great tomato and basil soup. You can add a dash of cream or crème fraiche at the end if you crave a creamy hit. Your options are endless! Put all of the ingredients apart from the tinned tomatoes and stock into a roasting tray and give it a good mix together. Roast for approximately 40 minutes, giving it a stir about halfway through the cooking time. When the carrots are soft it is ready. 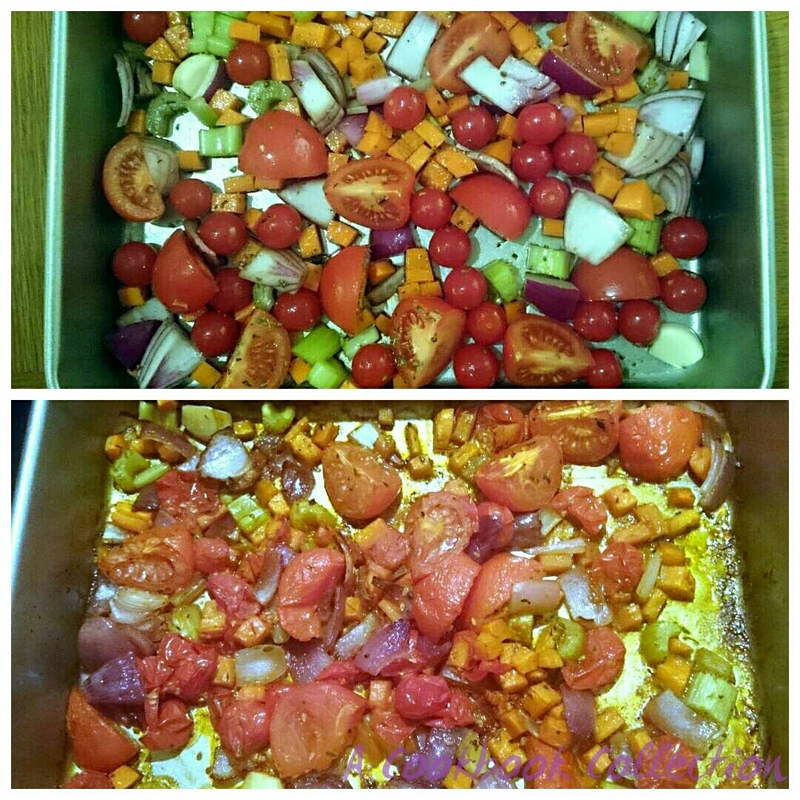 When the veg are cooked, tip the entire contents of the roasting dish into a blender with the tinned tomatoes and blend until it is as smooth as possible. Pour into a saucepan and add the hot stock. Over a medium heat warm through and taste to see if it needs any extra seasoning. It may also need some extra sugar depending on the tinned tomatoes that you use. Yum! Sounds delish Donna, perfect for this time of year! I must make a batch at the weekend! Thanks Rosanna, hope you like it!